Just before Christmas, Anna — cleaning out her kitchen before traveling home to Brazil for the holidays — presented me with a pound of chestnuts. I planned to roast them, per tradition, but on a whim I plucked one of my favorite cookbooks off the shelf and peeked in the index. Yes, a chestnut recipe! Wait, chestnut soup? Hmm. Might be too weird. But I had all the ingredients on hand, so I decided to give it a try. The original recipe in Jerry Traunfeld’s The Herbal Kitchen calls for steeping the soup with bay laurel leaves, but then he suggests an alternative with sage. I set off to pluck leaves from the squat, young sage by our front door and prepare the soup for Christmas Eve. The preparation of fresh chestnuts was far more difficult than I expected. I sliced up my thumbnail trying to hack chestnuts open, and it took a long time to peel them. But the resulting soup was delightful. So the day after Christmas I shelled the remaining chestnuts and froze them for our next lunch date, and made a mental note to buy vacuum-packed, ready-to-go chestnuts next time. This is a surprisingly delicate soup. 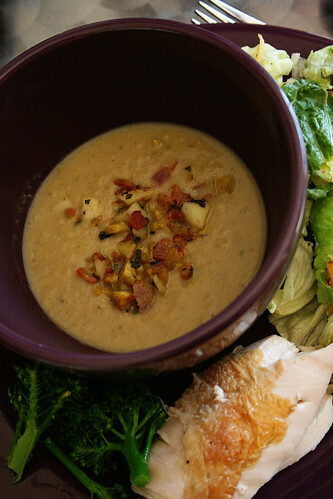 I love the complexity of the sweet notes in the soup itself, the chewy richness of the bacon, and the sprightly apple. It was a wonderfully warm accompaniment to our holiday meal, and I thought it would work for a January playdate. But by the time my turn to host rolled around, it didn’t feel like mid-winter. We had been basking in spring-like weather for a week. Would the soup still work on a sunny, 70-degree day? I forged ahead with my plan, but decided to incorporate some of the meager winter bounty from the garden as a nod to the good things to come this spring. I didn’t want anything else to compete with the soup, so I chose a straightforward accompaniment: roast chicken. I followed the Cook’s Illustrated Simplest Roast Chicken, brining an organic bird for an hour in the morning before roasting it. A cooked bird from the market would be a decent substitute, but roasting your own is easy enough that I pass on the sodium and additives and prepare my own when I can. I don’t usually shell out the extra buck per pound for an organic chicken, but I was feeling all fancy this week. In addition to the front-door sage, I brought in a few more things from the garden: broccoli just beginning to flower, with a squeeze of fresh lemon from our tree. I picked some lemon thyme, then dug up a few purple dragon carrots and shredded them into bagged salad greens. For the kids, I made my Whatever Noodles -- a simple, quick preparation of Asian noodles. The big hits with the kids: an herbed loaf of crusty bread, no butter needed, and hard-boiled eggs. Love this soup! Complex flavor, not too heavy — worked beautifully with a holiday meal and on a day that felt like early spring. This is a lot of work if done all at once. Which I did the first time. Ugh. If you don’t buy peeled chestnuts, I heartily recommend peeling them in advance and freezing them until you need them. The diced bacon also can be cooked ahead of time, to save on-the-spot prep. When I make this, I serve it with a simple, straightforward main dish — for our playdate, it was a simple roast chicken with salad greens and broccoli. This soup works as the star dish.